This is a record of my learning from my time at Pt England School. Hi to all you people in the world. I know I haven't posted In a while, that's just because I've been really busy moving to Australia! I now live in Melbourne, in a two story unit in Water Garden Mews, Sydenham. I really like my new school, friends, teachers, and class mates. Plus I'm going to my first camp in AUS on Monday! Its so exciting! Wish me luck. Until next time readers. As the young boy gripped tenuously on the unstable rock, it suddenly fell and he was left dangling on the ledge of a mountain. As quickly as he could he reacted and struggled to climb out of the situation he was in. Relieved and exhausted he was glad that he had reached his destination. At long last he had finally reached the dojo and thought to himself “My dream of becoming a kung fu master is finally here”. I hope the sensei accepts me”, hopes the boy. Anxious and curious he knocked on the dojo door with no idea on what to expect. 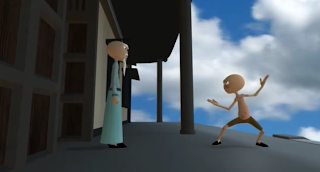 Suddenly the huge door opened and standing in front of the boy was the sensei. To show respect the young boy bowed, but the sensei pointed directly to his right and slammed the door. The young boy was confused and he thought to himself “What a waste of time”. By not giving up and losing faith the young boy thought he had to prove himself worthy by meditating all day and night til the morning sunrise. Still deep in meditation, the boy did not realize that the Sensei was standing in front of him. The boy opened one lazy eye and once again the Sensei pointed to his right and slammed the door. The hopeless boy dropped his head in sadness and walks away. Suddenly he had changed his emotions, from depressed to furious. He stormed back to the dojo and karate kicked the enormous door down. The sensei came out again. “I challenge you to a karate battle!” demanded the boy. The sensei pointed in frustration to his right. Turning his head the boy notice the sign that the sensei had been pointing at. “PLEASE USE THE SIDE ENTRANCE!” said the sign. Embarrassed and feeling dumb the boy curled his arms up like a girl and walked onwards. It was a cold, dark, gloomy night. I stumbled upon an abandoned hut deep in the heart of the forest. I was just about to enter the hut when suddenly I heard leaves rustling. I told myself it was just the strong wind blowing the autumn leaves around. But then I saw a dark shadow from the corner of my eye. I ran in the spooky hut, and hid in the dusty corner. But as the shadow got closer I started to see the face of the mysterious figure. It was one of the policemen trying to look for “the missing girl who had mysteriously disappeared a week ago!” “It’s ok I’m not going to hurt you. Are you Miss Luna?” The officer asked. “YES! YES I AM!” I ran to him and we went back home. One month later... I am now back at school, living my normal life again! Safe and sound with my two bodyguards. And I NEVER went or even thought about going to that horrible forest ever again. Man in the miror - Jowy,Ana,Kizi from Team 5 PES on Vimeo. JOEY, TARZAN, KAYCEE from Team 5 PES on Vimeo. I’m Jouan. I have two brothers named Ronn and Rodd. My mum’s name is Judith and my dad’s is Rufino. I am now 11 years old, and a year 7, in room 15 at Pt England School. My birthday is at September 17. Did I mention that my lovely teacher is Miss King. Well that’s me. Happy Reading! Geckos are amazing creatures. The more you learn about them the more you will want to own one!!! I hope you enjoy my movie! My favorite toy!! !